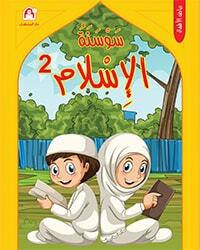 هيا إلى الإيمان المستوى التمهيدي is a book for kindergarten stage offered by Dar Al Manhal. It aims to teach kids principles of Islamic religion and manners for the elementary stage. هيا إلى الإيمان المستوى التمهيدي book is divided into thirty eight lessons that teach kids a number of positive behaviours, supported by amazing tales and graphics. The bookهيا إلى الإيمان المستوى التمهيدي focuses on different subjects, like Suwar (Quranic chapters); (Sourate Al-Fatiha, Sourate Al-Ekhlas, Sourate An-Nas, Sourate An-Nasr, Sourate Al-Kawthar, Sourate Al-Feel, Sourate Quraish, Sourate Al-Qadr, Sourate Al-Falaq, Sourate Al-Asr), Pillars of Islam, call for prayers, the five prayers, in addition to a number of ahadith nabawiya, as well as supplications and so on. The book also includes meaningful songs.